Not the kinds you buy in the grocery store, but freshly pressed homemade vegetable and fruit juices. Juicing is one of the best things you can do for your body. It provides your body with a concentrated source of vitamins and minerals in a highly absorbable form. You get a hefty dose of vegetables and fruit and all their valuable micronutrients down to the very last drop because the process of juicing makes them so easily assimilated by the body. Not only that, but a freshly pressed juice in the morning can be easier on your digestive system and a good way to start the day off with a nutrient-dense drink. I’ve talked a bit about the benefits of juicing before so now it’s time to talk about how to make your own juice at home with a juicer. 1.) Buy organic vegetables and fruits. You don’t want any pesticide residue in your fresh juice. You don’t peel fruits and vegetables when you juice so this is very important. 2.) Start with vegetables and fruits you like and are used to first. Juice vegetables like carrots, celery and cucumber which have a light, pleasing taste and then slowly introduce dark leafy greens as your palate becomes accustomed to the taste of fresh vegetable juice. 3.) Try to avoid making juices that are high in sugar content. While fruit juices can be a sweet treat every once in a while, they are high in sugar and can affect blood sugar levels. Try to mix in vegetables and make a juice that has more vegetables than fruit. 4.) Along those lines stay away from using too many root vegetables like beets and carrots b/c they have a slightly higher sugar content. Those are fine to start with but use them judiciously. 5.) Drink your juice as soon as possible after pressing. If possible, drinking the juice within 1 hour is optimal as it starts to lose its nutritional value as time passes. If you do store your juices keep them in a glass container in the fridge for up to 24 hours. 6.) Prepare your ingredients the night before to make juicing easier in the mornings. Washing everything ahead of time is a real time saver. Have your juicer out on the counter easily accessible as well so you don’t have to pull it out every time you need to use it. Here’s one of my favorite juice recipes to get you started. I call it my green lemonade; it’s a fennel, apple and celery juice with mint and parsley. 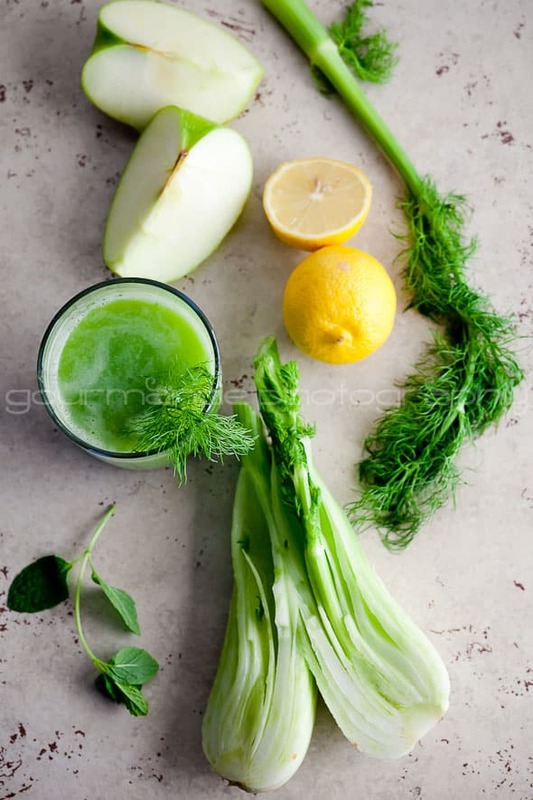 The combination of fennel, celery and parsley can be helpful for water retention as they have a mild diuretic effect. 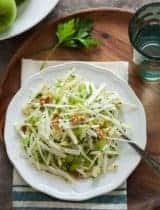 Celery has both sodium and potassium and is particularly good at replenishing lost minerals in the body after exercise or illness. 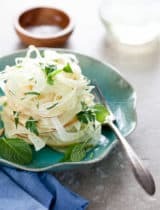 Mint is a good digestive aid as is fennel which has a slightly sweet and mild anise flavor. Parsley is a powerhouse vegetable when it comes to juicing, it’s is high in vitamin C and is considered an immune booster. 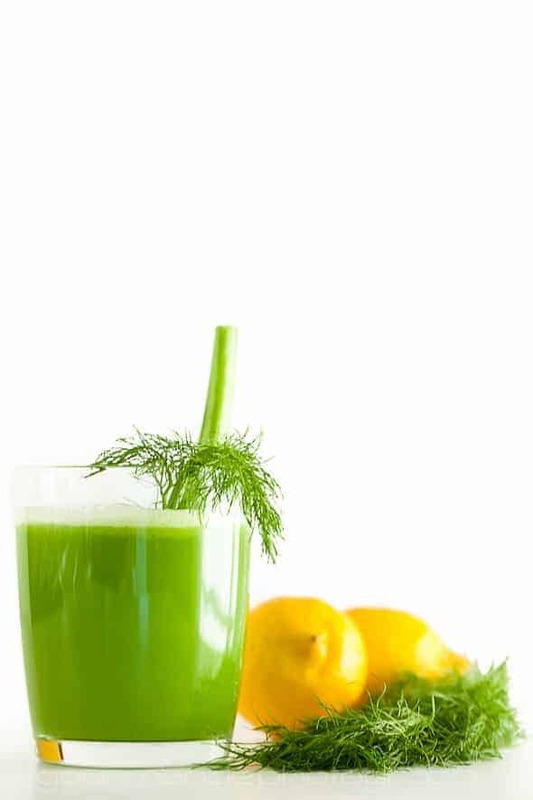 A little bit of tart green apple and freshly squeezed lemon juice is what makes this juice “lemonade,” as they offer a little sweetness and tartness and balance the juice’s flavors. This sounds really good! And I just bought my Vitamix a little over a week ago... perfect timing! The color is just amazing!!! This is definitely the most appealing green juice I've ever seen! I would've never thought of this but it sounds like a tasty combination. Happy photos! I just pulled my juicer out the other day and put it right on my kitchen counter so I would use it more. Love your combination of veggies and herbs in this juice. I used carrot, cucumber, kale and pear - a baby beginner green "lemonade." Planning on adding more greens the more I juice. Sylvie, your photography is just stunning. What perfect photos and a delicious healthy drink that just grabs me through the screen. I love the green color! And the addition f the fennel. Delicious idea Sylvie! And suddenly I need a juicer! Wow this looks fabulous! stunning Sylvie! and sounds delicious! I want to try this. Love the color! I love green drinks/smoothies and this one looks beautiful and so fresh. I can almost taste the tartness of the lemon and apple combination. Yum! I tend to have a kale smoothie every other day. It's a convenient and healthy on-the-go lunch. BTW, your pictures are gallery worthy. WOW! That juice is a beauty. I get on these juice kicks and then I put away the juicer to make room in the kitchen and then forget about it for awhile. This would be nice at lunch. Thanks! Simple yet delicious. A lovely recipe and beautiful snaps as always! 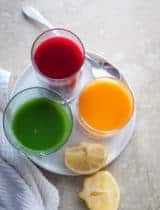 Juicing extracts only the juice of the fruits and vegetables, while a smoothie includes the fiber and pulp, so there are a few differences between the two. Juicing allows for faster absorption of nutrients. Because there's no fiber, juices are a concentrated and readily absorbed source of vitamins and minerals. Removing fiber also means that there's less digestive work needed to process the food. Because smoothies contain fiber, they are more slowly absorbed into the blood stream and your blood sugar levels remain stable and you will feel fuller longer. You can also add protein to a smoothie, making it a more balanced meal replacement. The fiber in smoothies also helps keep your digestive tract moving and feeds the good bacteria in your gut. So to answer your question, I think they both have their place in a healthy diet. Hi Alyssa, There are two main kinds of juicers: centrifugal juicers and masticating juicers. Centrifugal juicers are the most common, and in general, the most affordable. The food is pushed into a mesh chamber with a sharp rapidly spinning blade on the bottom. Centrifugal juicers work best with soft and hard fruits and vegetables, but not as well with leafy greens like kale or spinach, or wheatgrass. Masticating juicers are generally the more expensive type of juicer. These juicers use a low speed powerful motor to thoroughly press out the juice. Because of the slow crushing and squeezing, masticating juicers can better process leafy greens and wheatgrass, and the juice produced will last longer than juice made in a centrifugal juicer, which should be consumed right away as it starts losing nutrients fairly quickly. There are definitely quite a few options for you in the category of centrifugal juicers that would be around $100. This Jack LaLanne Juicer is less than $100 for example. I suggest you choose the juicer that will best juice the types of fruits and vegetables that you are most interested in using. What a GORGEOUS green lemonade Sylvie! Cheers! This juice sounds SO good and refreshing! You might be the only person on the planet to tempt me into drinking a green drink. It's one of my quirks, not healthy I know but I'm working on it :D It is my year to be daring. Sylvie, I'm smitten by your photography! 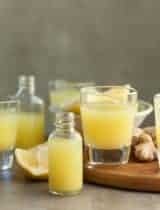 Myhusband and I are starting a juice fast on Monday for a week, we will be trying this recipe. Look forward to more. I really got to get on the juicing train Sylvie. Still January so I am not late to the party yet! :) Have a great weekend!! My juicer needs to come out more and now I think I have the recipe to make! Looks fabulous! Absolutely stunning photographs, as always :) I got to your blog very recently, but have been hooked ever since. 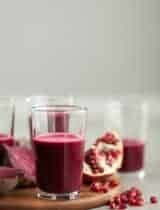 The juice looks great, just the kind that I need to stick to my detox plan. Except for the mint, I love this combination, and how did you get your green to be such a pretty green? Your blog is my favourite these days. I have been guzzling juice such as yours for some days now. Thank you so much for more ideas. I am sure the apple in my juice will give it the necessary tangy kick. I started juicing last spring and got hooked on it. 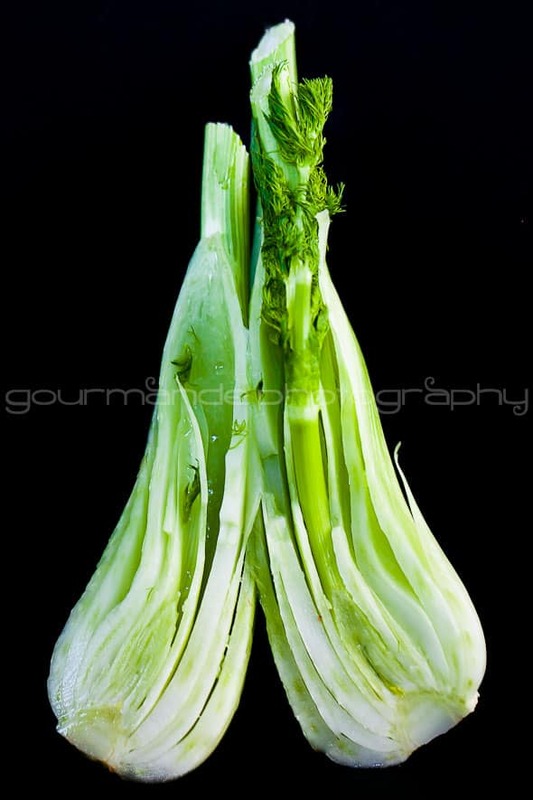 Haven't tried fennel yet but its next on my list. The color in your drink is amazing. You even make juice look gorgeous Sylvie. Wow...and it's healthy too? Perfect. I have started to include more juices for breakfasts. Most of the time it was apple, carrot and ginger. I will try adding fennel! Gorgeous post! Love the colour! Looks healthy and delicious, surely things that don't always go hand in hand. That is such a gorgeous colour! Love this,and its something I've been meaning to do for a bit. Maybe now...thanks for the inspiration Sylvie! Those pictures are worth a 1000 words...and more! I absolutely love the ingredients that you have chosen for this! I'm into too much juicing these days. 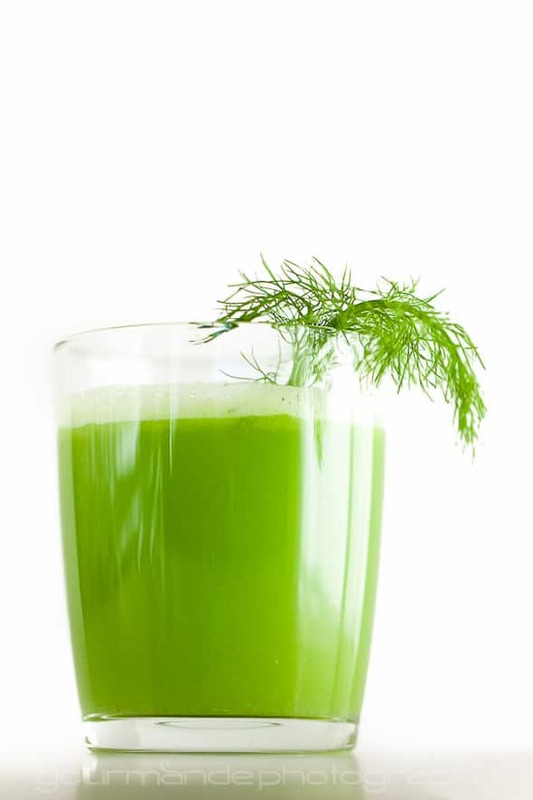 There's nothing like having freshly pressed juice to make you feel good :) Love the lovely green you've pictured--I still have to try celery and fennel. Hope you are having a wonderful new year! Beautiful photos as always, Sylvie. No juicer me (I eat all the raw I can) but the combo of flavors on this is amazing! This sounds expensive to me. At my grocery store it costs almost 1 dollar for a regular apple, let alone an organic one. I just wish there was a less expensive to b healthy. I absolutely agree with you, it can be very expensive to buy all organic but I try to look at it as an investment in my health. I think in the long run it will be cheaper to spend the money on whole organic foods and avoid costly medical bills down the line. That being said I know how difficult it can be to buy absolutely everything organic so I think it's best to at least try and avoid buying the dirty dozen. Here's a useful app that comes in handy for knowing which foods to avoid buying conventional when shopping: Dirty Dozen. This sounds so tasty, Sylvie. 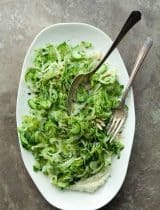 I've used all of these with the exception of fennel in a juice and it was delicious. Yum! Gorgeous photos and I am right there with you. I'm simply craving vegetables lately. This is a gorgeous concoction. 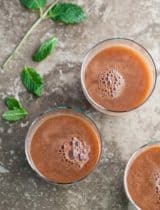 Do you recommend any particular juicer? I'm thinking of getting one, but don't know where to start. That's a good question and I think you need to consider what kinds of fruits and vegetables you plan on juicing and how often you planning on using it before purchasing a juicer. Here are the main differences between the two most common types of juicers on the market today. There are two main kinds of juicers: centrifugal juicers and masticating juicers. Centrifugal juicers are the most common, and in general, the most affordable. The food is pushed into a mesh chamber with a sharp rapidly spinning blade on the bottom. Centrifugal juicers work best with soft and hard fruits and vegetables, but not as well with leafy greens like kale or spinach, or wheatgrass. Masticating juicers are generally the more expensive type of juicer. These juicers use a low speed powerful motor to thoroughly press out the juice. Because of the slow crushing and squeezing, masticating juicers can better process leafy greens and wheatgrass, and the juice produced will last longer than juice made in a centrifugal juicer, which should be consumed right away as it starts losing nutrients fairly quickly. So choose the type of juicer that you think works best for your needs. Hope that helps! Love this! 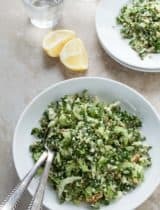 My friends just got a juicer and have been looking for recipes -- I'll share this with them. I've been wanting a juicer for a long time. The only thing pretending me is counter and cabinet space. When you have a closet kitchen it's just hard to buy much. Anyway, your green lemonade is making my mouth water. Your SO right about juicing. It's really beneficial to your body. Your juice recipe looks fantastic! I can't wait to try this combination-looks and sounds great. And I love the added health benefits-I need that to offset all the sugar I consume. :) That first photograph is awesome-so clean and bright. This is gorgeous! I would drink more juice if it looked like this. Thank you for your detailed comment and recommendations! I use both a high speed blender and a juicer as they do different things. The blender I use is a Blendtec and it's what I use to make smoothies and "whole fruit" juices which have the pulp but a vitamix is great too. I use an Omega juicer for my juices but I've heard great things about the Hurom, seems like a great quality masticating juicer that would be good for greens and harder fruits and vegetables. I'm just now catching up to green juices. this recipe is a step up for me, but I really want to try to add more than the bare minimum (what I do now). I love the idea of mint. Is the mint strong? Maybe one little leaf is enough? The mint adds freshness here but it's not at all overwhelming. I'd say try at least a small palm full of mint leaves, I don't think you would taste just one leaf. This looks like a really refreshing juice recipe. And so simple! Thanks for the juicing tips too!